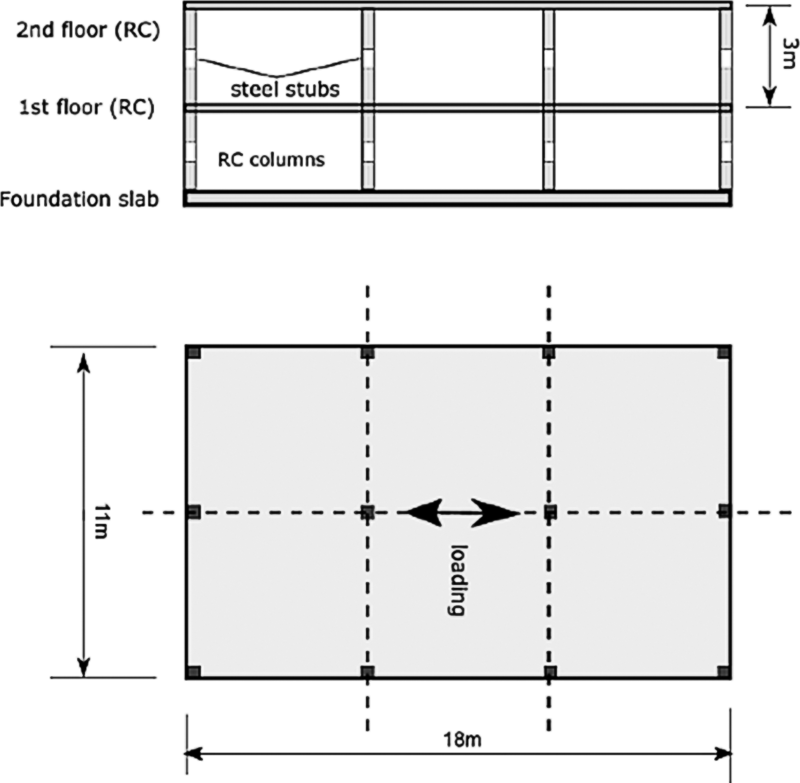 Within the scope of the seismic response of reinforced concrete structures, the main aim of this proposal is to study the response of flat slab floors under combined gravity and lateral loads, to develop the Seismic European Code regulations for these structures. The significance of the research is based on the lack of specific provisions in the Eurocode EN1998.1 and on the widespread and growing use of these structures in many European seismic countries with relevant seismic actions, following code and research developments advocated in the European seismic research community (Spence et al., 2007, Pinto et al., 2007). Limited knowledge on the stiffness and non-linear deformations of these systems leads to difficulties in design of flat slabs. On the basis of Eurocode 8, flat slabs cannot be considered to contribute to the primary seismic resistant system and can be designed as secondary systems supporting gravity loads at the design deformations, due to the compatibility with the primary system. This leads in the structural analysis process to calculate very high internal forces and moments, that do not correspond to the real actual system behaviour and make yield strength verifications and reinforcement design difficult and uneconomical. The stiffness and energy dissipation of these systems is low, particularly for high seismic demands, but the ultimate non linear deformation capacity can be significant, provided that some limitation is imposed considered in the shear effects of the gravity loads on the connection punching shear capacity of slab-column connections. This behaviour has clearly been shown by a wide in the scientific literature of the topic, particularly in researches in North America, and by a number of studies on isolated slab-column connections by the proposing team based on European design codes. Within this research, flat slab floors will be tested for seismic and cyclic loading at the reaction wall facility of the JRC – ELSA. Pseudodynamic testing will be carried out for the seismic loading using nonlinear substructuring to model the primary seismic resistant walls. Repair of the more damaged connections will be carried out using post-installed transverse reinforcement, followed by the cyclic test to failure. The testing of floors will complement and complete the knowledge of previous experiments carried out by the proposing team on isolated slab-column connections, giving information about the stiffness and deformation capacity of these structural systems. The results will provide the basis for a design procedure based on deformation capacity assessment. Defining the conditions for the flat slab system supporting the gravity loads in correspondence of the design deformation demand will result in a design proposal for the European seismic code EC8. The results will allow verification of the Eurocode and Model Code 2010 punching shear models for eccentric shear (shear and moment transfer from columns) and reinforcement detailing rules for flat slab floors. Testing strengthening and repairing methods applicable to damaged connections is relevant to social safety, considering the many existing structures in European seismic zones; this could be used also as a preventive retrofit solution. Pinto A., Taucer F., Dimova S. (2007) “Pre-Normative Research Needs to Achieve Improved Design Guidelines for Seismic Protection in the EU” JRC EUR 22858 EN 2007, 34 pp. Spence R., Lopes M., Bisch P., Plumier A., Dolce M. (2007) “Earthquake Risk Reduction in the European Union. Proposal for a European Earthquake Risk Reduction Programme – a Discussion Document” European Association for Earthquake Engineering, following Lisbon Workshop 2005.